This harrow is suitible for work behind tractors and quad bikes with a minium 15hp and above. 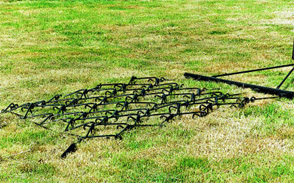 The SCH Mini Harrow is suitible for removing dead vegetation from lawns, paddocks and other large areas of grass. The harrow can also be used for seed bed preparation, both levelling and covering. We have customers who successfully use these harrows for maintaining sand surface maneges.